"The hauntings in are scary, but the humans are scarier." A STRANGER IN ALCOTT MANOR is the third book in the Alcott Manor series by Alyssa Richards. Each book in this "Alcott Manor" series strikes a slightly different note -- but the star of the show is Alcott Manor itself and general spookiness is usually always on tap. A STRANGER IN ALCOTT MANOR is the closest of all three books in this series to some of my favorite Stephen King stories. This is a story about ordinary people who do crazy things, are thrust into bizarre and unnerving supernatural situations, and malice hangs over everyone and infects what should be normal human interactions. 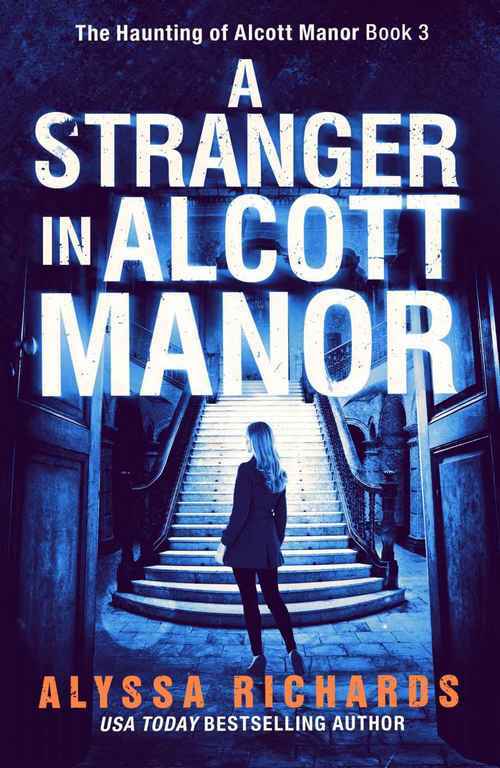 The hauntings in A STRANGER IN ALCOTT MANOR are scary, but the humans are scarier. This tale starts out much as any contemporary romance might. Peyton Alcott returns to her hometown and specifically to her ancestral home, only to be plagued by people making demands on her and the ghost of her lost love. At the outset, readers learn that there is some event from Peyton's childhood that she is mentally blocking. This event is somehow connected to Alcott Manor and a nasty little girl's disappearance. Alyssa Richards builds the suspense as various facts are tossed out to tease the reader and increase the speculation about what happened so many years ago. This story is told from multiple perspectives, yet still keeps key aspects of characters' motivations vague. If this were a regular contemporary romance, Peyton's long-lost love Beau would ride back into town and try to woo her away from her current fianc�. There might me hilarious misunderstandings and sexual tension. In this story, Beau is trapped in a ghostly macabre limbo with Peyton as his only hope out. Beau and Peyton clear up their issues from the past and have some tender moments together, but the danger is never far away. Peyton has to try and unravel several mysteries while also reconcile her feelings for two men she cares very deeply about. Alyssa Richards writes a heroine who has strength but is realistically flawed. A STRANGER IN ALCOTT MANOR is a stellar bit of storytelling a cauldron of secrets, death, and strong emotions. This is a great story for readers who enjoy ghostly romances, suspense, and complex mysteries. Alyssa Richards' next book is sure to be another tangled mystery for readers to enjoy. Determined to solve the mystery, she�s drawn into a hidden dimension where time and truth are twisted. Confronted by secrets that threaten to unravel her bright future, she�s forced to choose between old feelings and new possibilities. A Stranger in Alcott Manor is the third and final standalone book in a riveting paranormal romance trilogy. If you like contemporary gothic settings, romantic ghostly tales, and simmering chemistry, then you�ll love Alyssa Richards� otherworldly conclusion.